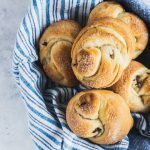 This basic sweet dough recipe gives you a tender, soft crumb, and can be made into any sweet bread or roll you’d like. Melt the butter in a small saucepan, then remove it from the heat. Add the milk and pour it into the bowl of a stand mixer fitted with a dough hook. Measure the temperature to be sure it’s between 90F and 110F. If it’s hotter than 110F, allow it to cool so that it doesn’t kill the yeast. Sprinkle the yeast, then the sugar, over the warm milk and butter, then give it a stir to wet all of the yeast. Allow it to sit for five to ten minutes, or until the yeast is foamy. Lightly beat the egg in a separate bowl, then add to the milk & yeast mixture. Add in the flour and salt and turn the mixer on low until the dough has come together into a ball. Turn the mixer up to medium and knead for 4-6 minutes, or until it is a smooth and taut. Remove the dough from the mixing bowl, shape the dough into a ball, and place it into a greased bowl. Allow it to rise for 1 -1 1/2 hours, or until doubled in size. At this point, you can use it to make a variety of sweet breads or rolls. Simply shape however you like, then cover with a cloth and allow to rise for about another hour, or until the dough is soft and puffy. For the Knots Pictured: Divide your dough into 6 equal portions. Roll each one out into a rectangle (it doesn’t have to be completely square) that’s about 4″x7″, then brush on melted butter. Sprinkle with about a teaspoon of sugar, then mini chocolate chips. Roll them up along the long side, then pinch the seams to seal. Roll the dough “log” under your hands while applying gentle pressure to stretch and lengthen it, then turn a simple knot with the dough. Mix the leftover melted butter with about a tablespoon of milk, then brush it on the outsides of the knots and sprinkle with sugar. Bake at 350F for 20-25 minutes, or until the outside a golden. For Cinnamon Rolls: Roll the dough into a rectangle about 12×18, spread butter over it, then sprinkle with sugar and cinnamon. Roll it up in a log along the longer edge, then cut it into 1 1/2″ thick slices. Place them in a greased baking dish, allow them to rise for 45 minutes to an hour, then bake at 350F for 25-30 minutes, or until golden brown. For Breads: Roll the dough out into a rectangle 8″x24″, then spread with any fillings you wish. Roll into a roll along the long edge, then slice it in half lengthwise. Turn them filling side up, and twist them around each other, like a braid. Turn them into a circle, and pinch together the ends. Allow it to rise for 30-45 minutes, then bake at 350F for 20-25 minutes, or until golden brown around the outside.